Few Egyptian symbols enjoy as much popularity in modern tattoo symbolism as the Eye of Horus does today. However, it was easily 4,000 years ago that this amulet symbol first acquired its positive powers. Among the ancient Egyptians, the legend of Horus, the god with the head of a falcon, was well known. He was the son of Isis, the great matriarchal magician, and Osiris, the greatest of the gods. But Osiris had been murdered by Seth, his own son and the brother of Horus. In a conflict between Horus and Seth over the throne, Horus defeated his brother but his left eye (which was the moon – his right eye was the sun) was plucked out in the battle. The god Thoth was able to restore the eye though, which explained to the ancient Egyptians the reason for the waxing and waning of the moon. 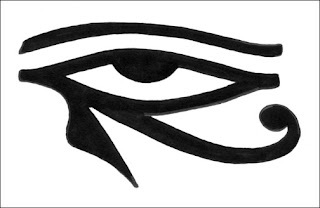 The Egyptian word wedjat means “the sound one” and the restored Eye of Horus is thus also known as the wedjat eye. Its first use as an amulet was actually performed by Horus himself who offered it to his dead father Osiris, restoring him to life. The great healing and protective powers of the wedjat eye as an amulet were widely known and believed as early as the Old Kingdom (2300 B.C.E.). Large numbers of them were often placed among the wrappings of mummies in addition to being worn as pendants and rings. The unique form of the eye, with the downward spiraling element which starts at the forward corner is taken from the distinctive facial markings of hawks. The most common colors used for the amulets were blue and green since these represented regeneration to the ancient Egyptian. As Horus came to symbolize the forces of good and light, while his vanquished brother Seth came to represent the forces of evil and darkness, the wedjat eye also grew to stand for the constant struggle between the two. The eye of Horus, sometimes also called the eye of Ra represents a sign of power given to the wearer by the gods of the time. It can also be a symbol that you are protected form harm by the god represented in the eye, whether that be Horus or Ra. The Egyptian word for this symbol is Wadjet, which literally translated means simply god or goddess. Horus himself was the falcon headed Egyptian god that originally represented the sky, but also came to be recognized as the sun and moon god as well. He is one of the oldest off the Egyptian gods, and survived all of the dynasties or Egypt as well, while others came and went. His eyes were said to be the sun and moon, with his right being the sun and the left being the moon. The reason the sun is brighter then the moon was supposedly because he injured his left eye in a battle with Seth after Seth, the god of chaos, murdered Horus' father. This represented the division of Egypt as two separate kingdoms at the time as well, each ruled by a different king because of various economic and military problems that the country was facing at the time. It is very rare to see the two eyes together, as they represented different times of day, and so one would be resting while the other watched over mankind, although there are rare examples of both eyes being seen together, which are said to have been able to see everything. It was said that Set the patron god of Upper Egypt and Horus the patron god of Lower Egypt battled for control of the entire country, which was only resolved when the rest of the gods sided with Horus, after both he and Seth presented their claims to rule Egypt, and thereafter Egypt itself was reunited into one country. This is probably where Sets evil nature comes from, and he was said to have lost a testicle in the battle with Horus, which is said to be why the desert is barren. Horus hereafter was the dominant god in Egyptian worship and was symbolic of the country being reunited as well. The Eye of Horus itself is represented, not by a human eye as many people think, but by a falcons eye with a tear in one corner, and the separate parts of the eye can be divided in ancient Egyptian measurements into 6 parts, which represent smell, sight, touch, thought, hearing and taste. These are representations of the powers that Horus has as well as the abilities that humans share with the gods. In todays society it is still used in a variety of places, particularly in jewelry and symbols of power in countries of the middle eastern regions from which it originated and where Egypt held power at the time. Despite popular belief it isn't the eye that can be seen at the top of a pyramid on the one dollar bill. That eye is the eye or providence, which is just an all seeing eye of god, rather then specifically Horus's eye, although it may have been adapted from Horus hundreds of years ago into Christianity as we see it today. Similarly it isn't the eye that the Freemasons use either, despite popular belief. That is another eye of providence, which is a Christian rather then Egyptian symbol meaning that god can see you whatever you are doing. In the case of the Freemasons it probably just signifies their influence and power as a semi secret society, as well as the requisite belief in a divine being that all masons must have. It is also said to be representative of love and mystery today, and is often worn as a brooch or other jewelry as a symbol of love or commitment between two people, rather then being a symbol of omnipotence as it used to be. It is also seen as a representation of inwardly thinking and philosophy as well. The eye of Horus depicts peregrine falcon's right eye. It's a symbol of the Sun, and it was also called eye of Ra (by the Egyprian Sun god, Ra). The falcon's left eye represents the Moon. The Eye of Horus, healed by Thoth, was an amulet, or magic charm. The Ancient Egyptians also used it to describe fractions. The Egyptians sometimes had had two eye symbols, with the left eye being the Eye of Horus, symbolising the moon, and the right eye being symbolising the Eye of Ra, or the sun. The Eye of Horus is an ancient Egyptian symbol of protection. The symbol is seen on images of Horus' mother, Hathor, and on other deities associated with her. The ancients believed this symbol of indestructibility would assist in rebirth. Thus, funerary amulets were often made in the shape of the Eye of Horus. After Osiris was murdered by his brother Seth, Horus fought with Seth for the throne of Egypt. In this battle, Horus lost one of his eyes. The eye was restored to him by Thoth and it became a symbol of protection for the ancient Egyptians. After this battle, Horus was chosen to be the ruler of the world of the living. In magic the Eye of Horus symbolises protection and the bringing of wisdom. The eye also symbolises our ability to see with clarity and truthfulness. For the last couple of days I've been searching for Meaning of The Eye of Horus and finally I stumble into your blog, it has great info on what I'm looking and is going to be quite useful for my social studies. DO YOU WANT A SUMMER JOB?